Reducing our sugar intake is something we’re all more aware of nowadays. We’re used to traffic light food labelling and it’s great if “sugar” is in the green. Lots of us want to go even further though and cut out sugar altogether. For many, cutting out sugar is no easy feat. Trying to read through the noise on food labels can be tricky, not to mention the various names “sugar” takes on. It’s found in loads of unexpected foods, making it difficult to really know what sugar your consuming on a day-to-day basis. An alternative to sugar that we love at the Talk to Mums HQ is Natvia. If you haven’t heard of Natvia then read on and find out about not one, but two competitions we’re running with Natvia. We’re giving our readers the chance to win a huge hamper care of Natvia, and also a spa day! Purchase a tub of Natvia sweetener, currently £3 in Tesco, and post a picture on Instagram using the hashtag #T2MNatvia. It’s that simple! Check out their full range of sweetener products on their website. Natvia is a stevia-based sweetener made from 100% natural ingredients. You’ll find no nasties and no bitter aftertaste. Our mums recommend Natvia as a sugar-free alternative to use in baking, cooking and of course, hot drinks like tea and coffee. Whatever your reason for cutting sugar from your diet, Natvia is a convenient alternative. Enjoy guilt-free sweetness, replacing refined sugar with this healthy alternative. At Talk to Mums, we’ve been taste testing Natvia and using it in everyday cooking. Our mums add it to fruit, sprinkle it on cereal and bake cookies and cakes for the whole family to enjoy. And shhh, no one has noticed a difference! “It actually tastes like sugar!” – Sophie, Mum of two from Bedford. Where can I Buy Natvia? Natvia is currently sold at Tesco, Ocado, Amazon.co.uk and Wholefoods Market. The 300 gram canister is currently on offer at Tesco for £3. Take the Natvia Taste Test and Win! Are you ready to taste test Natvia and see if your family can tell the difference? Talk to Mums has teamed up Natvia to bring you two amazing competitions. Not only are we offering our lucky winners a gigantic hamper, but also a relaxing spa day. To be in with a chance of winning, all you need to do is pick up a tub of Natvia from any of the stockists listed above and post a picture on Instagram using the hashtag #T2MNatvia. It’s important you use the hashtag otherwise we can’t track your entry! We will then pick three lucky winners who will each receive one of our MEGA hampers, jam-packed with goodies to enjoy. 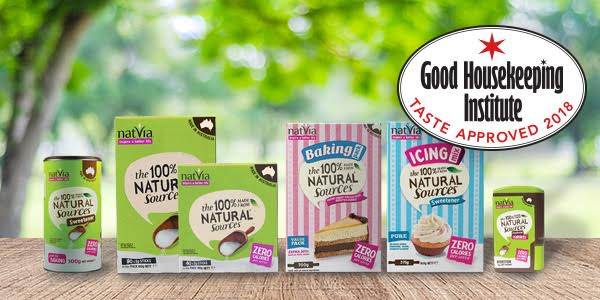 For more information about Natvia, and for exciting sugar-free recipe ideas, be sure to follow them on social media.